By Susan Able with photographs by Barbara Adbeni Massaad, courtesy Interlink Publishing Group. It was the winter and Barbara Abdeni Massaad couldn’t stop thinking about the Syrian refugee families she had read about who were sleeping in tents. The president of Slow Foods Beirut, who is also a well-know cookbook author, writer and photographer, visited a refugee camp in Zahle, Lebanon, and saw the struggles first hand. Massaad knew that good food could make an impact in the lives of the refugees. With a friend, she started making soup for the Hamra refugees. She took pictures and interviewed the refugees about their experience and the idea for a humanitarian cookbook was born. The Soup for Syria project began. 100% of the U.S. sales of Soup for Syria will go to the United Nations High Commissioner for Refugees to provide food relief. In a large bowl combine the tomatoes, garlic, pepper paste, cilatnro, cayenne, cumin, lemon juice and olive oil. Mix thoroughly with a spoon or spatula, don't use a whisk. Heat a large stockpot over medium-high heat, add the tomato mixture, and cook until the mixture becomes fragrant that tomatoes begin to break down about 1-2 minutes. Add the clams, stock and bastruma and bring to boil oer high heat. Reduce the heat to simmer, cover and cook, shaking the pot occasionally just until all of the clams have opened, Using a slotted spoon, transfer the clams to serve in bowls, leaving the broth in the pot. Add the butter to the broth and check for seasoning. The basturma and the calms carry a good deal of salinity, and the soup may not need salt. 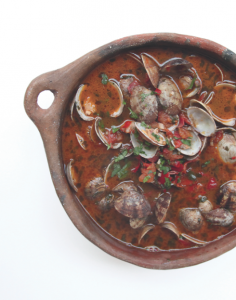 Ladle the broth over the clams, garnish each bowl with cilantro leaves and serve with thick slice of grilled bread. **Many of our area markets with Middle Eastern products carry basturma including Mediterranean Gourmet Market in Alexandria, (703) 971-7799. Soup for SyriaEdited and photographed by Barbara Abdeni Massaad. Interlink Books, 2015. 208 pages.